Lots to see and do these next few weeks at the Antique Automobile Club of America (AACA) Museum! 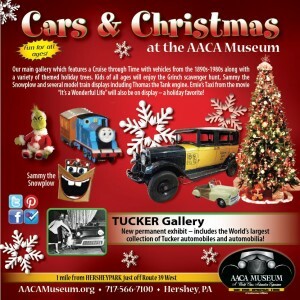 Running from November 14, 2015 – January 4, 2015, Cars & Christmas is the annual holiday event at the Museum. Holiday decorations are up on each level, with dozens of decorated Christmas trees throughout. Be sure to look for the model train displays. Also during this time, the Museum is encouraging visitors to consider donating non-perishable food items or a new, unwrapped toy (for Toys For Tots) to be shared with those less fortunate. Always a favorite, The Grinch and Max Scavenger Hunt, and out front to greet visitors will be Sammy the Snowplow. On display (except for Sunday, November 23rd) will be Ernie’s taxi from the movie, It’s a Wonderful Life. New this year is a display of nine vintage bicycles along with the opening of their newest permanent display, The Cammack Tucker Gallery featuring the world’s largest display of Tucker automobiles and automobilia. For more information about the AACA Museum, please visit their website.